Home Uncategorized Shot Science: Is There a Way to Make Fireball Taste Better? Shot Science: Is There a Way to Make Fireball Taste Better? Love it or hate it, Fireball is a growing part of drinking culture these days. The sticky-sweet, cinnamon-flavored Canadian whisky has usurped the throne of Jägermeister as the shooter of choice for thrill-seeking partiers across the country. What’s the appeal? It’s cheap and crowd-pleasing. It’s flame-covered label makes it “manly” enough for even the bro-iest frat bro, while it’s candy-like flavor render it palatable to that sorority girl who hates the taste of alcohol. But here’s Fireball’s dirty little secret: A lot of bartenders drink it too. At Honeycut, you can order blended shots of Fireball and Jameson pulled from a tap in their disco room. It’s known to sell out most nights. That got us thinking. Could Fireball be improved by other additions? 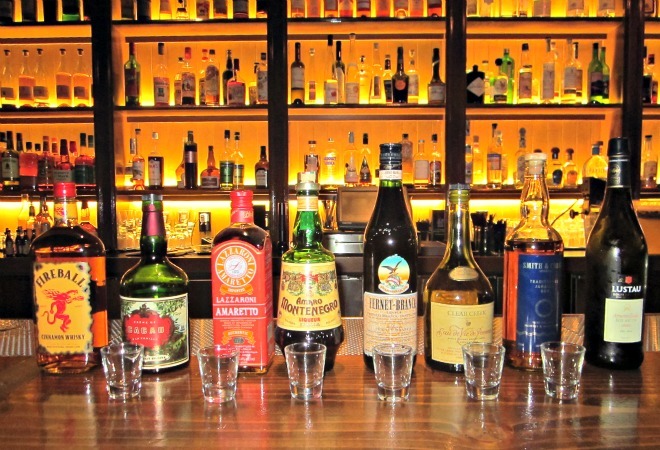 We met up with Day to taste test some mixed shot combos using en vogue spirits and liqueurs in a rare combination of high and low drinking culture. Was there a diamond in the rough? Result: Fireball and sherry wins hands down. If you don’t believe us, go try it yourself. A bottle of good amontillado sherry will only run you around $15. As for Fireball, we’re sure you can find that around somewhere.